Get ready for some rock-solid co-op as the frenzied FPS and its mighty space-mining dwarves explode onto Steam Early Access and Xbox Game Preview tomorrow! SKÖVDE, Sweden – Feb. 27, 2018 – Deep Rock Galactic enforcers Coffee Stain Publishing and Ghost Ship Games today announce that Deep Rock Galactic officially opens for business tomorrow! 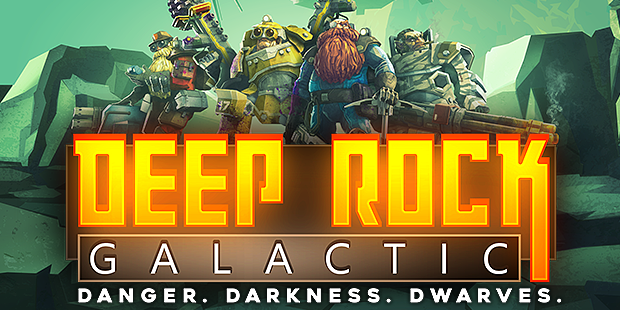 Enterprising dwarves across the globe will be able to join their most ambitious mining operation to date when Deep Rock Galactic digs into Steam Early Access and Xbox Game Preview for $24.99/€22.99. In Deep Rock Galactic players take up arms as one of four classes of badass dwarven miners, each with their own invaluable set of skills and gear. The Driller, the Engineer, the Scout and the Gunner must work together to survive a relentless onslaught of ravenous aliens and escape the procedurally generated caves with their bounty intact. Starting tomorrow players can undertake a plethora of different missions in 7 unique regions of Planet Hoxxes, with plenty more content to come. 4-player Co-Op: Work together as a team to dig, explore, and fight your way through massive cave systems filled with hordes of deadly enemies and valuable resources. 4 Unique Classes: Mow through enemies as the Gunner, scout ahead and light up the caves as the Scout, chew through solid rock as the Driller, or support the team with defensive structures and turrets as the Engineer. Fully Destructible Environments: Destroy everything around you to reach your goal. There is no set path so you can complete your mission your way. But proceed with caution, you don’t want to stumble into an alien swarm unprepared! Procedurally Generated Cave Network: Explore a network of procedurally generated cave systems filled with enemies to fight and riches to collect. Light Your Path: The underground caves are dark and full of terrors. You will need to bring your own lights if you want to illuminate these pitch-black caverns. Deep Rock Galactic first began recruiting brave space mining dwarves when it entered Closed Alpha on Steam in December 2016. Since then, more than ten thousand test-subjects have played the ever-improving Closed-Alpha builds and delivered invaluable feedback to the team. By popular demand, the team have thus far added upgrades, drones, vanity items, a mini-boss, biomes and refrained from fixing the broken barrel physics! Deep Rock Galactic will launch on Xbox Game Preview and Steam Early Access at midnight PST tonight! The Deep Rock Galactic Soundtrack, 22 full tracks of gut-punching space dwarf synth goodness will also be available via Steam for $7.99/€7.99/£5.79.